Rooms, services 80 comfortably furnished rooms are offered by La Prima Fashion Hotel Budapest to guests looking for accommodation in Budapest. The hotel ensures a pleasant stay for you and your family by offering chield-friendly services. Air-conditioned rooms are available for reservation (please take a look at the information sheet of each room to see if it has air-conditioning). If you have a suitable portable device, you can connect to the Internet via a wireless network (WiFi) available at the hotel. 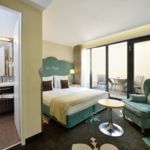 You can find the exact list of services provided by La Prima Fashion Hotel Budapest (including those for extra fees) and the exact equipment of the rooms on the information sheet below and on the information sheet of the respective rooms. The rating of La Prima Fashion Hotel Budapest is 9.4 from the maximum 10, 9 based on actual and valid guest ratings and reviews. "Foarte curat, bine amplasat, la Recepție am fost primiți bine , patul foarte bun !" "parkolás az utcán lehetetlen-a közelben, a közeli parkolóház költséges"
"A recepciós hölgy, nem a kedvességéről híres. A szálloda parkolás lehetősége, nagyon rosszul van megoldva"
"Nagyon jó helyen van, szép és tiszta."